Innate immunity is an evolutionarily conserved first line mode of defense against a pathogen attack. Major progress has been made both in plants and animals in deciphering key components of the innate immunity involved in perceiving microbes (Kawai and Akira, 2009). Animals, like plants, are able to launch successful defense responses against invading microorganisms. 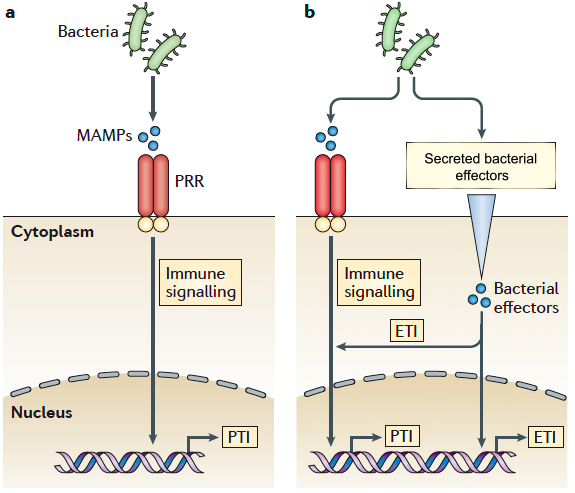 Recognition of conserved microbial associated molecular patterns (MAMPs) by intracellular (NLRs) and extracellular (TLRs) receptors triggers activation of signaling cascades culminating in the expression of genetic programs of alarm and defense. This comprises the production of chemokines and antimicrobial peptides from innate immune effector cells. In addition to the Pattern Recognition Receptor-based recognition, plants have also evolved a sophisticated system of effector-triggered immunity (ETI) based on the direct or indirect recognition of pathogen-encoded effectors via NLR proteins (Jones and Dangl, 2006). An integrated model for detection of pathogenic bacteria. (A) During a bacterial infection, microorganism-associated molecular patterns (MAMPs) ligate pattern-recognition receptors (PRRs) and induce immune sig­naling pathways and pattern-triggered immunity (PTI). 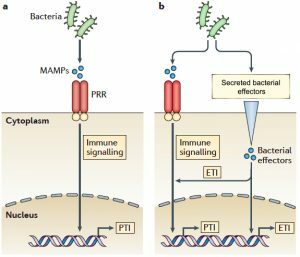 (B) Resistant hosts can sense the presence of bacterial effectors and acti­vate effector-triggered immunity (ETI). ETI can occur independently of the primary immune signaling pathways or by amplifying the ongoing PTI response. Importantly, this effector-triggered immunity has been shown to be a powerful means of augmenting the defense response specifically to pathogens but not to harmless commensals, and makes a major contribution to how plants cope with microbial attack and restrict pathogen growth. Our previous work revealed in metazoans an innate immune pathway that specifically responds to virulence factors encoded by virulent bacteria that we referred to as AVI (Boyer et al., 2011, Diabate et al., 2015). The identification of such system with similarities to plant ETI is paradigm-shifting and indicates that animals like plants have evolved sophisticated strategies to gauge the virulent potential of microbes and respond commensurately (Stuart et al., 2013). Using the prototypal RhoGTPase targeting toxin CNF1 we proved that the animal host is able to monitor the activity of virulence factors (Boyer et al., 2011). Our initial work has been extended to SopE a Salmonella virulence factor activating RhoGTPases. SopE activity sensing involves NOD1 and HSP90 that were shown to be important for the transcription of the IL-8 cytokine during infection (Keestra et al., 2013). Additionally, the virulence factors inactivating RhoGTPases have recently been shown to be sensed by the NLR Pyrin leading to IL-1beta maturation (Xu et al., 2014). 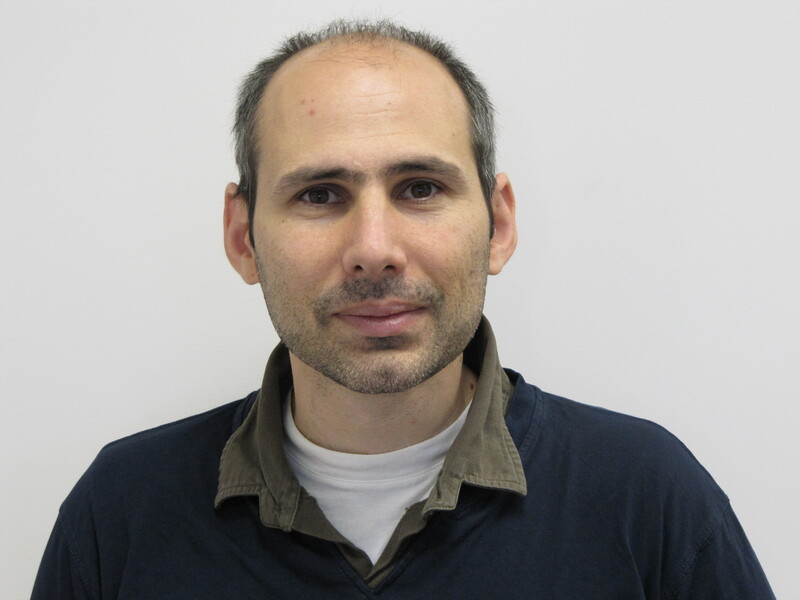 Our laboratory aims at deciphering the the molecular mechanism of this immune response and how the pathogenic strains counteract this defense mechanism (Diabate et al., 2015). In parallel, in collaboration with the microbiology departments of the Nice hospitals, we study the virulence of emerging pathogenic bacteria, Leishmania parasites as well as Papilloma viruses always in relation with the host response with the goal to develop innovative antimicrobial strategies.